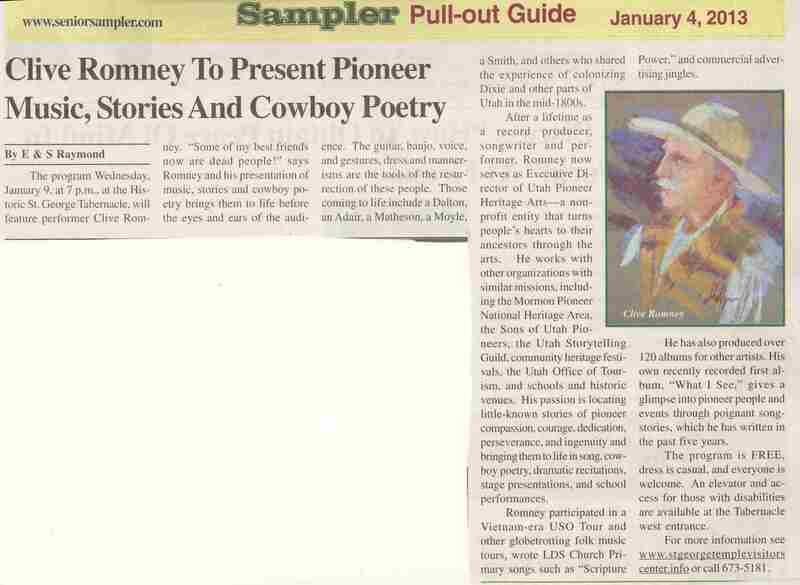 call (435)673-5181, or see the Senior Sampler article. Part of the CareCentennial series of exploration events. hiking shoes. It will take about 45 minutes to an hour. 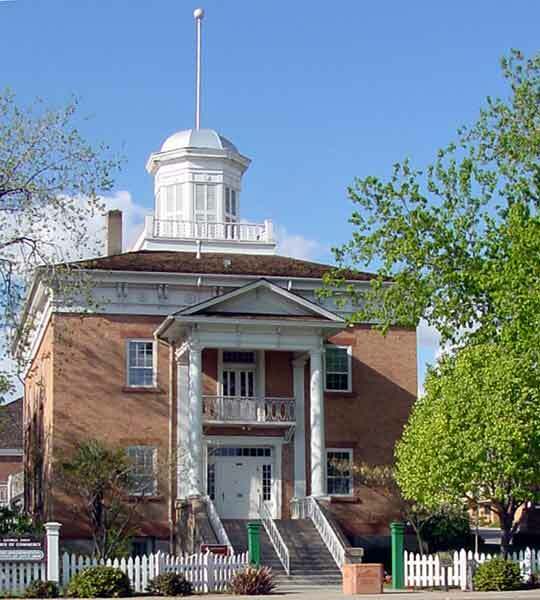 For further information, see http://www.carecentennial.org/walks.php or call (435)251-3629.
be the history of the Woodward Junior High School. knowledgeable. It will be a very interesting evening. revealed discovery of several highly significant fossil localities. at the Social Hall, 47 East 200 North, from noon until 2:00 pm. 1144 N. Lava Flow Drive, from noon until 4:00 pm. will offer free rides from noon until 4:00 pm. This walk will be led by Virgin Mayor Grow. Meet at the Virgin Town Hall, 75 South Mill Street, Virgin UT. 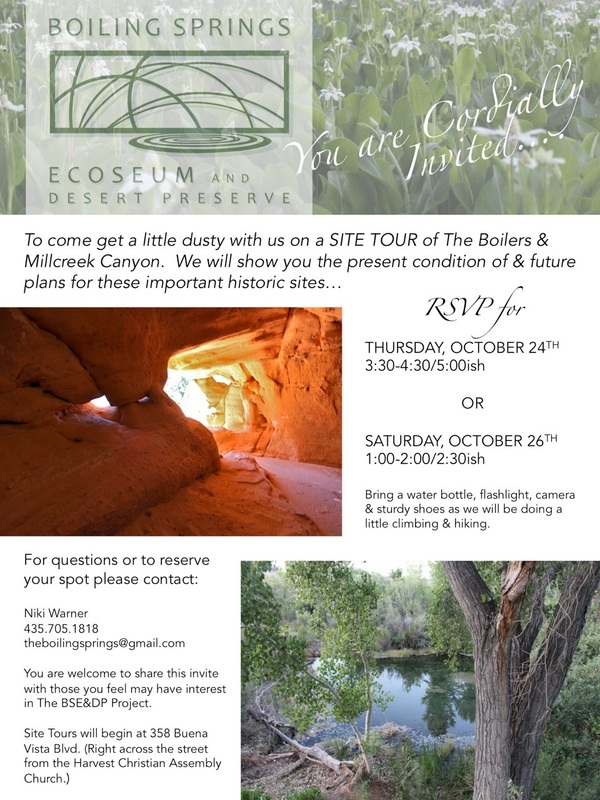 Nicole Warner will speak on the Boilers and Lion's Head (or Millcreek Canyon). history and rehabilitate the ecology of these locations in the community. spots and learn about their valuable history. For reservations, go to http://FamilyHistoryExpos.com or call (801)829-3295.
the scenes" with several local and regional American Indian sites. these old methods at work. Pipe Spring National Monument, 406 N. Pipe Spring Rd. 60 miles east of St. George, UT on UT 59 and AZ 389. Park entrance fee applies (interagency annual, senior, and access passes accepted). Sponsored by the National Park Service (NPS). Contact: Andrea Bornemeier at (928)643-7105 or andrea_bomemeier@nps.gov. Demonstration: Paiute Beading and Basketry. for sale from the gift shop. and Rock Art along the Old Spanish trail. being made right here in your own backyard. Walk with Mayor Pat Cluff as part of their St. Patrick's Day Celebration. Meet at the Majestic View Lodge, 2400 Zion Park Blvd., Springdale UT. he molds the blacksmith's legend. to continue honoring this great lady by erecting a future monument. "Ancient Quicksand Features of the Navajo Sandstone"
the why in the formation of these natural features that take our breath away. delightful features of the early Jurassic period. Hands-on Workshop: Sandal Making by John Olsen. from gathering and preparing the materials to the final weaving. "Antone B. 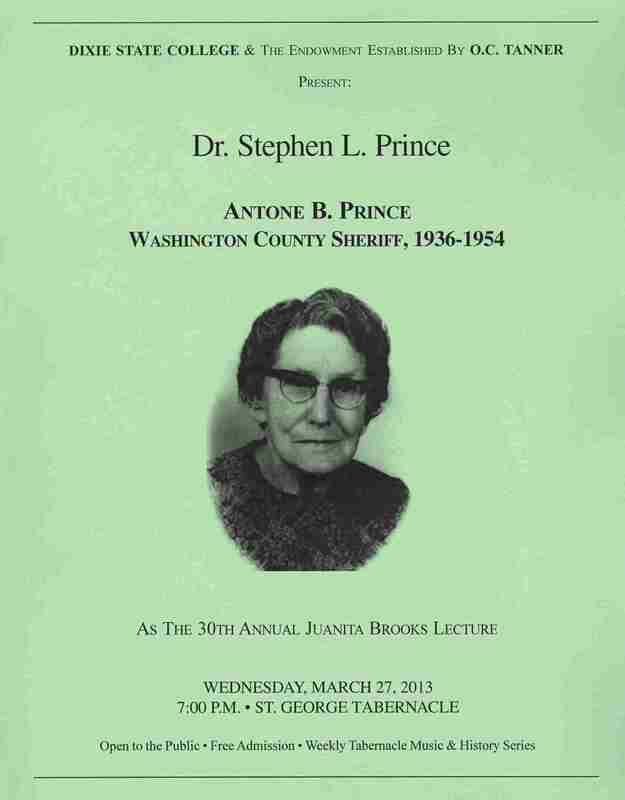 Prince: Washington County Sheriff, 1936-1954"
For background information on Sheriff Price, click here. Friday, 3/29/2013, 9:30 am - ??? Virginia "Beezy" Tobiasson will give us a private tour of the museum. Tassi and Pacoon ranches, and the western end of the Arizona Strip. in Overton can do so. The Museum is open on Fridays until 5:00 pm. 345 E. Riverside Dr. in St. George. history and the subtleties of this art. National Monument by Andrea Bornemeier. during the late 1930s. Learn about the life of the CCC "boys"
to come and share their memories. Bring water, hat, sunscreen, and hiking shoes. Meet at Pipe Spring National Monument, 406 N. Pipe Spring Rd. "Left to Rot on the Hillside: Intercultural Death on the Western Frontier"
by Historian W. Paul Reeve from the University of Utah. 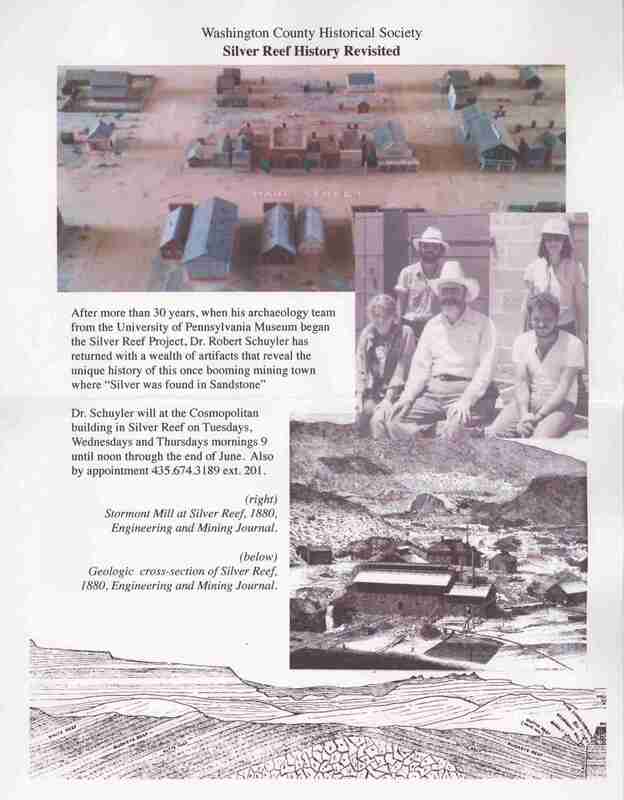 silver miners in southwestern Utah and southeastern Nevada. "Redeeming the West: A History of the Scientific Approach". Representative William Hooper's response before Congress to Anti-Mormon legislation. and Western Railroad. 1902, excerpts from Elwood Mead's, Irrigation in Utah. For the presentation notes, click here. "Virtual Exploration of Your Public Lands; Discover BLM thru Social Media!" public use sites via Facebook, YouTube, Tumblr, Twitter, Instagram and more. more about local hikes and recreation activities! the north rim of the Grand Canyon to their current reservation west of Ivins. motivations and dynamics of this time period. sophisticated economies and food storage methods. This lecture will be held at the Canyon Community Center. educational tips to help the public best prepare for the fire season. The Sons of Utah Pioneers will be installing a monument at the fort. This is in recognition of this area being the first organized native mission. The installation will begin at 9 am. A program will follow at 10 am. of the Harmony valley. Bring your own lunch. For additional information, call Lyman or Karen Platt at (435)867-8422.
well as an introduction to some of the Reserve's unique desert dwellers. including several of the Reserve's protected Desert Tortoise. Walk with Mayor Tom Hirschi and the Hurricane City Council. Meet at the Hurricane City Community Center, 63 South 100 West, Hurricane UT. led by Kelton, Edd, and Lyman Hafen. the old church/school, and the cemetery. 345 E. Riverside Dr., St. George, UT 84770. Bring a sack lunch and drinking water. It could be a little cool there. For information, contact Eric Fleming at coyoteemf1@gmail.com or (435)879-1161.
and share the stories of communities in and around St. George, Utah. and is preserved at the American Folklife Center at the Library of Congress. A few of the most interesting ones are broadcast of Public Radio. of the Old Spanish Trail Association bi-monthly field trip. Meet at the Leeds post office at 9:00 to carpool. The tour will end about lunch time. This walk will be led by walk with Washington City Mayor Ken Neilson. Meet somewhere TBD in Washington City UT. "We Still Walk In Their Footprint: The Civilian Conservation Corps in Northern Arizona 1933-1942"
by Dr. Robert L. Schuyler of the University of Pennsylvania. research in Silver Reef and has returned for further activities. This program is free and open to the public, but seating is limited. Call (435)688-3200 to reserve a seat. "Mormonism in the 19th Century American Mind"
to the Hurricane Mesa Test Facility (HMTF). Anyone interested in going must sign up by Sunday, May 19. The trip will be limited to the first 30 people to sign up. Sign up with Eric Fleming at coyoteemf1@gmail.com or (435)879-1161.
sauerkraut, buns, potato salad, and water. Or bring your own sack lunch and drink. 63 South 100 West in Hurricane at 9:15 am. to enter the site. Cameras are allowed and bug spray is advised. and available to meet with interested parties. For further information or registration, click here. Special presentation by Dr. Robert Schuyler of the University of Pennsylvania. capacity. No reservations will be taken for this special event. helped to make St. George the beautiful city we now enjoy. The museum is located at 145 North 100 East in St. George. For further information, contact Jeanine Vander Bruggen at garyvb44@aol.com or (435)574-0307.
various excavations throughout the years. Meet at the Cosmopolitan Restaurant building, near the Wells Fargo Silver Reef Museum. For further information, contact SilverReefFoundation@gmail.com or (435)879-2926. Cemetery from where the bodies were exhumed and returned to China. Meet at the Catholic Cemetery. Walk the Toe Trail with Ivins Mayor Chris Hart. Meet at the Toe Trail at Tuacahn. in our area as part of our birthday celebration! Meet at the St. George Town Square. demonstration of the traditional Paiute game of Que' Pauck. on land through the sustainable reuse and preservation of existing buildings. Join Enterprise Mayor Lee Bracken for a walk in conjunction with CornFest. Meet at the Enterprise Elementary School, 216 South 100 East in Enterprise UT. following the Armijo branch of the trail through our area. of activities including a parade, food, music, games, and exhibits. Shuttle buses will be available on Friday and Saturday. This walk will be led by Santa Clara Mayor Rosenberg and will kick off Swiss Days. Meet at the Santa Clara Town Hall, 2721 W. Santa Clara Drive, Santa Clara UT. "The Economics of Heritage Preservation for Fun and Profit"
1) "Leveraging Cultural Equity in Historic Buildings"
2) "Money Matters: Rehab Tax Credits at Work (Leeds Tithing House Case Study)"
3) "Economic Benefits of Historic Preservation in Utah"
4) "Adaptive Reuse of the 1875 John Graf Home (Ka'ili Restaurant Case Study and Tour)"
There will be an optional dinner after at the Ka'ili Restaurant (old John Graf Home; $10). The workshop in free and open to anyone. It will be held at the Santa Clara City Hall. 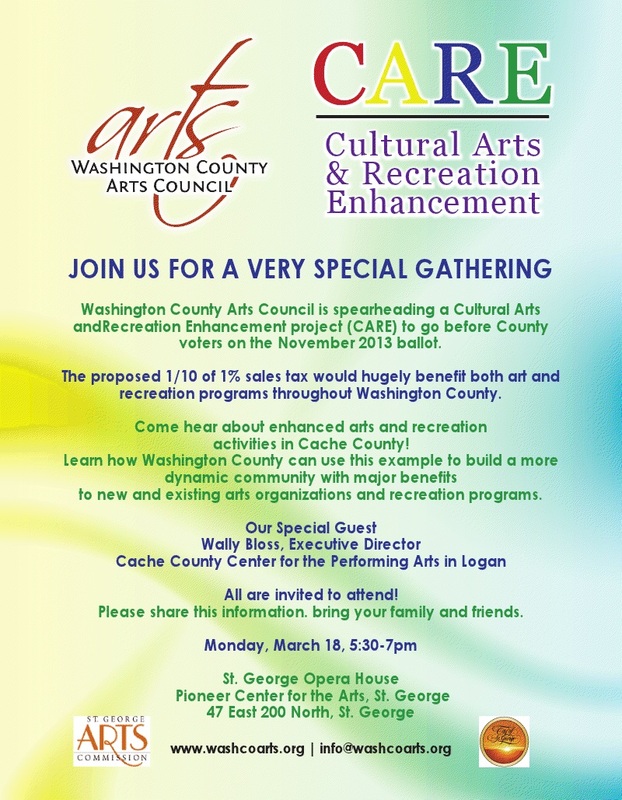 For further information, contact Herb at (435)669-9059 or Richard at (702)445-3650. To Parowan and on into Piute and Sevier Counties. For the itinerary, schedule, and program, click here. For additional information, contact Dr. Leo Lyman, lionman011@gmail.com. David Evans. It will be good, as will the field trip next day! Walk with Leeds Mayor Alan Roberts. The speaker will be Keith Davis. as we will be doing a little climbing & hiking. Characters from the past will appear and greet visitors; bring a flashlight. Tickets (including Silver Reef Museum admission) are $5 in advance, $7 the day of the event. or in person at the museum, 1903 Wells Fargo Road in Silver Reef. A spoken-word journey into the Pleistocene. authors of "Why the Moon Paints Her Face Black"
and featuring live entertainment by Eric Dodge. Dinner, live entertainment, and auction, $12.50. At the Dance Hall at the CottonTown Village in Washington, Utah. 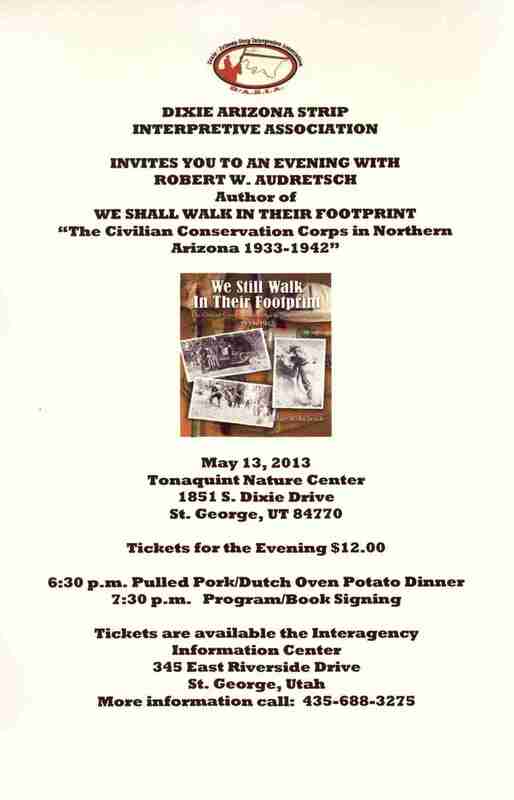 For information and tickets, call George Staheli at (435)628-1077.
which was a critical issue for farming people in the Southwest. exert its influence on contemporary artists. This lecture will be held at the Zion Lodge Auditorium. John W. Rockwell is the great, great grandson of Porter Rockwell. who was a bodyguard for both Joseph Smith and Brigham Young. He was well known for his endurance, loyalty, and relentlessness. "Spies, Lies and Counterfeit Ghosts" by Col. Alva L. Matheson, USAF Ret. Late in 1944, a B-24 bomber crashed in the mountains above Cedar City. was no sign of the crew or of the plane's super secret Nordon bomb sight. For years the crash was a source of mystery and speculation. the notorious Nordon bomb sight. Meet at the Silver Reef Museum in Silver Reef. The lecture is free and open to the public. No reservations are required. Walk with Toquerville Mayor Darrin LeFevre. Meet at the Toquerville Town Hall, 41 E Old Church Road, Toquerville UT. Grafton Restoration Project sponsored by Citizens for Dixie's Future. They'll be doing a quick little restoration project out in the Grafton area. cottonwood plantings. You will need gloves, sturdy shoes, sunblock, and adequate water. For further information and to register, see click here. Walk with LaVerkin Mayor Karl Wilson as part of La Verkin's Winter Fest. Meet at the LaVerkin Town Hall, 435 N. Main, LaVerkin UT. Dr. Doug Alder will speak about the history of the Saint George Temple. co-authors of the recently published book "All That Was Promised"
which will be the subject of his presentation.